I love the Story of Ferdinand. We've read it many times in our homeschool. I'm pretty excited to see an adaptation on the big screen this winter! I have a feeling we will be reading the book a bunch this fall as the trailers come on television and my 6 year old starts seeing them. Cast: John Cena, Kate McKinnon, Gina Rodriguez, Daveed Diggs, Gabriel Iglesias, Bobby Cannavale, David Tennant, Anthony Anderson, Flula Borg, Sally Phillips, Boris Kodjoe, Jerrod Carmichael, Raúl Esparza, Karla Martínez, Miguel Ángel Silvestre. 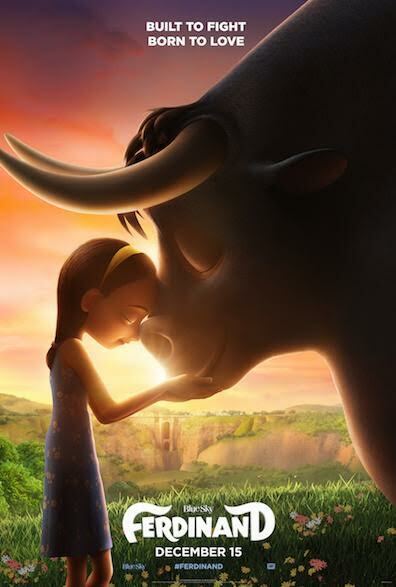 From Blue Sky Studios and Carlos Saldanha, the director of "Rio" and inspired by the beloved book "The Story of Ferdinand" by Munro Leaf and Robert Lawson, "Ferdinand" is a heartwarming animated comedy adventure with an all-star cast that includes John Cena, Kate McKinnon, Gina Rodriguez, Anthony Anderson and many more.